As part of its ‘Endless Evolution’ programme, DuPont Corian has launched an improved and expanded range of ready-made basins, each characterised by a versatile, contemporary design and incorporating innovative technical features. To launch the renewed shapes offer, DuPont Corian has created a large format publication entitled ‘Portraits of Life’ – designed present the many ways these basic basin shapes can be mounted and integrated into design solutions made from Corian in a variety of colours (including the new deep blacks, browns and greys). The full range now includes a total of 40 models, which are divided into sink and basin ‘families’. The name of each family reflects its distinctive aesthetic. Bathroom range (20 models): Purity (two models); Relax (three models); Refresh (two models); Energy (three models); Calm (four models); Peace (one model); Serenity (three models), and Care (two models for the healthcare market). Kitchen range (20 models): Smooth (two models); Sweet (eight models); Spicy (five models), and Sparkling (five models). “It is a versatile material, which can form organic or linear shapes and permits endless creative possibilities, allowing the freedom to design spaces tailored to personal tastes. “In the kitchen and bathroom, the seamless construction and extensive colour palette of Corian enable the material to suit a variety of interior styles. The renewed and expanded offer that we have introduced will contribute significantly to the fascinating design possibilities of Corian, and to its ability to deliver long term beauty and functionality”. 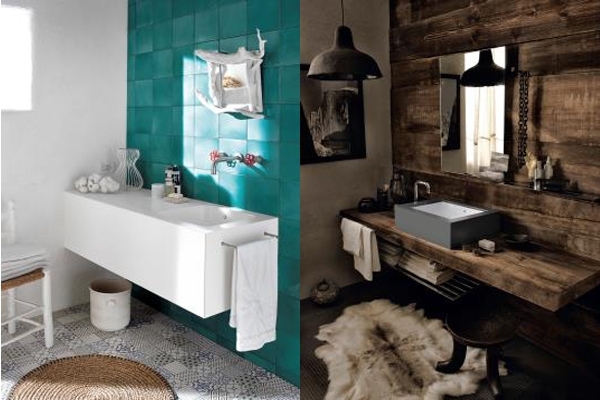 Image shows Corian’s Mediterranean Summer (left) and Rustic Chic. ‹ What Happens if We Run Out Of Water?